The iPhone 6 and 6 Plus cameras have taken joint first place in the influential DxOMark Mobile ranking of smartphone cameras – three points ahead of the two Android smartphones which previously headed the list, the Samsung Galaxy S5 and Sony Xperia Z3. DxO praised both the technology behind the faster focusing of the iPhone 6 camera, and the optical image stabilization of the 6 Plus – and said that both cameras performed equally well in lab tests and real-life use. They have very good, generally reliable auto-exposure in a wide range of lighting conditions and they have both fast and accurate autofocus. Output from the 8-Mpix stills improves the high level of detail in both outdoor and indoor lighting. In low light, noise reduction is handled well with images revealing fine-grained luminance noise and little of the distracting color (chroma) noise. The company also said that the high-quality displays made them ideal for on-the-fly editing. Both displays have stunning clarity, high contrast, excellent color and wide viewing angles, which is promising for viewing (and editing) stills and video on the go. Video capture doesn’t include 4K but both feature 1080p at 60 fps with slow-motion options at 120 fps and 240 fps. Apple is featuring the cameras in one of its new TV ads, and we were equally impressed in our own tests. You can check out more time-lapse and slo-mo videos here. 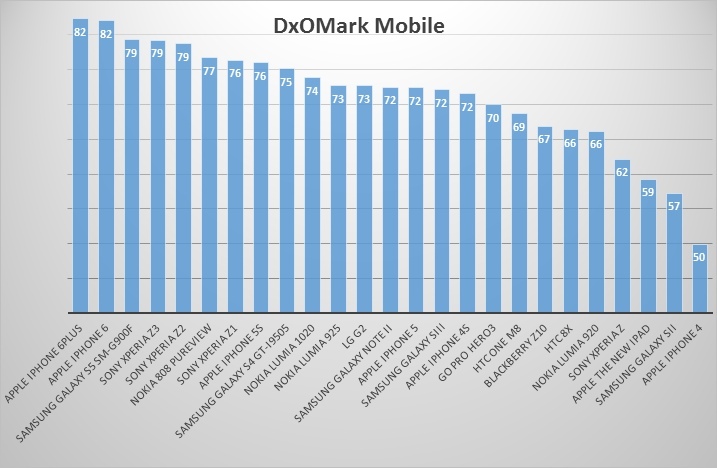 The full DxOMark Mobile rankings can be seen below.